Who: Dallas-based packaged-goods company Kusin & Kusin launched the first-ever dry-application, odor-eliminating pet wipe, in a clever reusable pouch designed by Los Angeles branding firm Ferroconcrete. 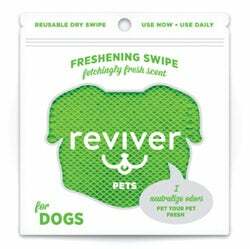 What: Reviver Pets Freshening Swipes are sold exclusively at Petco. The existing "pet-odor removing" products are based on wet sprays or wet wipes, says Scott Meisse, project director at Ferroconcrete. "Reviver Pets is radically different by being dry and completely reusable, two things no one would expect in the category. We didn't really consider any product as competition; we considered consumers' expectations and purchase habits as the competition and greatest challenge." Why we love it: This package has personality: It is fun yet clean, bold and effective. The resealable perforated pouch, with minimal marketing copy, is designed to sit in a custom countertop display. It relies on a clear window to show the dry wipe, and the shape of the window clearly indicates the end user: dogs, cats or pet parents.